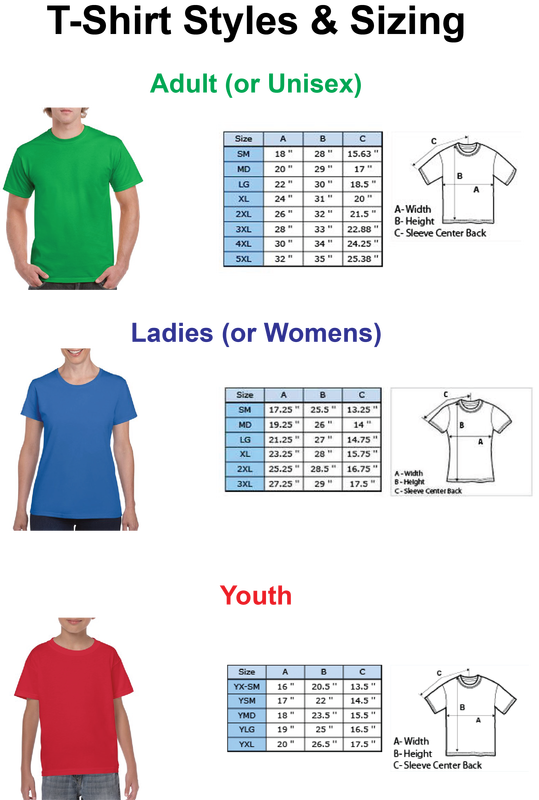 See the T-Shirt Styles & Sizing chart for the measurements for each size. The measurements pertain to a T-shirt laid out flat on a table. The circumference of the shirt is twice the width measurement. Pre-Sales concluded on July 1. ​Those who ordered T-Shirts during the Pre-Sales may pick them up during the General Sales starting the last weekend in July. 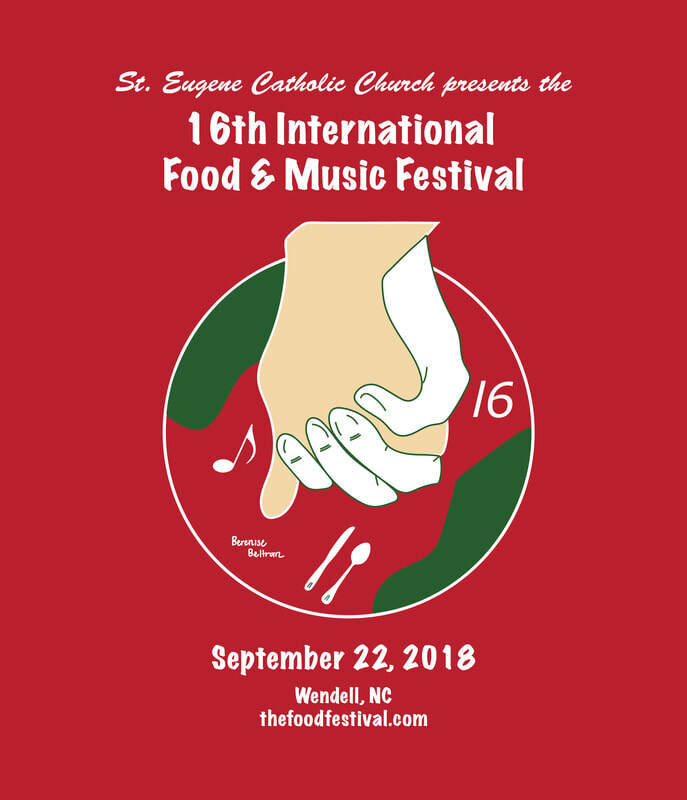 When: General Sales for the 2018 Festival T-Shirts took place at Masses on July 29–29, August 4–5 and Aug. 25-26. The final T-shirt sales are between the English and Spanish Masses on Sept. 15 and both before and after the 9 AM English Mass on Sept. 16. Price: $10.00 per T-Shirt by cash or check. A credit card payment option will be available at most Masses (the credit card charge will be $10.30 per shirt). Payment: Payment must accompany the sale. Styles: Adult, Ladies and Youth. The screen will be printed on the front for all styles available at the General Sales. Shirt Weight: The T-Shirt weight will be the same 5.3 oz. weight that was used in 2016 & 2017; it is a lighter weight than was used in 2015 and earlier years. ​General Sales Colors: The color choices are Red, Irish Green and Carolina Blue. These were the three most popular colors (excluding Azalea) during the Pre-Sales. Most of the remaining T-shirts are in the Red color. Special Orders: There will be no special orders during the General Sales. Only those T-Shirts on hand will be available for purchase. There is no guarantee that your desired style, color and size will be available. 3XL Sizes: There will be no Adult or Ladies 3XL T-Shirts at the General Sales. For 2018 magnets are again offered. Magnets are $2 each. They are undated—they will be just as relevant for future festivals as for this year's. Magnet sales will be held at all masses at St. Eugene Catholic Church on weekends during the T-shirt sales. 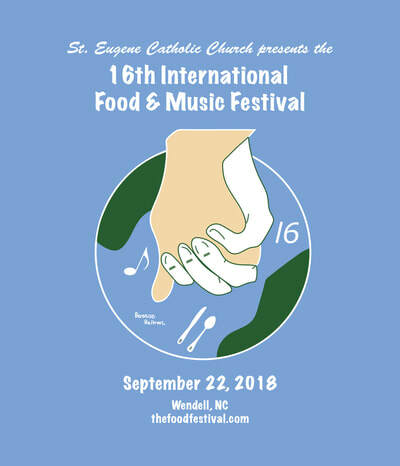 Children in the Religious Education program at St. Eugene Catholic Church submitted eleven candidate concepts for the logo for the 2017 International Food and Music Festival. The winning concept was chosen by a vote of the parish members. This year's winner was Berenise Beltran. The logo on the T-Shirt differs slightly from the official logo in order to facilitate its implementation by the T-Shirt vendor. Father Archie congratulating Berenise Beltran on her winning Logo Concept on May 19. Congratulations to all 11 of the parish youth who participated in the contest! Special recognition goes to our other 3 Finalists: Felicia Azidue, Chris Johnson and Allen Montreal.